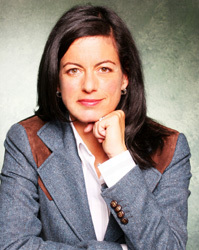 Laurie David had a long and interesting career in the entertainment business, serving as David Letterman’s talent coordinator and forming her own management company that handled many top comedians and comedy writers. She has produced comedy specials for HBO, Showtime, MTV and Fox, served as vice president of comedy development at a division of Fox, and developed sitcoms for Twentieth Century Television. Not necessarily the resume of a committed environmental activist, but David’s epiphany came during a break in her career, after her marriage to Larry David of Curb Your Enthusiasm and Seinfeld fame. Today, if you haven’t seen an information-crammed environmental special produced by Laurie David, it’s because you aren’t paying attention. Her live Earth to America special featured Leonardo DiCaprio, Tom Hanks, Robin Williams, Will Ferrell and many others. Her excellent and sober (no rock music, no celebrity voice overs) HBO documentary Too Hot Not to Handle will air on Earth Day, April 22 (7 p.m. Eastern Time, 8 p.m. Central). And Participant Productions’ An Inconvenient Truth, featuring former Vice President Al Gore talking about global warming, is coming soon to a theater near you. She’s featured in the March issue of Vogue, and in May she’s guest-editing the “green” issue of Elle. David has a communicable sense of urgency, and it’s no wonder considering the inexorable pace of climate change. 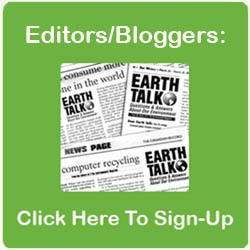 E Magazine: How did you become an environmental activist? Laurie David: I think it started seriously when I became a mom. I had been working my whole life, and I stopped to have a baby. At the same time, about eight years ago, I happened to meet Robert F. Kennedy, Jr. and John Adams, then the head of the Natural Resources Defense Council (NRDC). I had breakfast with them, and Bobby started talking about the environment as the civil rights movement of our time. It really struck a chord with me. I just started to read everything that I could, and then I had an epiphany. I was out on the street walking the carriage around for hours at a time because I had a colicky baby, and everywhere I looked I saw these huge SUVs. It disturbed me because I knew that they got poor fuel economy. And all of my smart friends who understand these implications were all driving them. The car manufacturers were spending millions and millions of dollars convincing everybody that if you cared about your kids you’d put them in this big car. How ironic that was as a marketing campaign, because SUVs turned out not to be that safe. And, of course, they’re also are rolling back our fuel economy performance by 20 years. And if you increase fuel consumption you double the carbon dioxide (CO2) in the atmosphere. So I started to get really active. I had the luxury at the time to do it because I wasn’t working full time, and there you go. Is that when you got involved in Arianna Huffington’s Detroit Project, which targeted the poor environmental performance of SUVs? Yes, that’s when we came up with those commercials. That was an amazing thing because it really sparked the debate. Within a day of releasing those ads we were being ridiculed and mocked on every right-wing radio and TV show in the country. It forced people to discuss it. Right now, the President of the United States is saying we are addicted to oil, and where is our oil money going? We are supporting the Middle Eastern countries that hate us. That is exactly what we said in those ads four years ago. Have you heard of plug-in hybrids? Right now, a number of entrepreneurs are working on versions of the Prius or Ford Escape Hybrid that can run on pure battery power and extend the range of the vehicle, in effect creating a 100 to 150 mile-per-gallon car. They’re being made by home engineers and so they are not really close to production in any real sense. The ones that are being built are designed to show the car companies that they could do it if they wanted to. Well, it seems like this is the wave of the future. There are still waiting lists for these hybrid cars, so I would think they’d be kicking into gear and making more of them. I think it’s great what people are doing. There is a lot going on in this country from the business level and the individual level. The problem is that we are seeing no federal action. But in lieu of that at least there are things being shaken up. Can you describe your strategy in producing the HBO climate change documentary Too Hot Not to Handle, the comedy special Earth to America for TBS, and the film An Inconvenient Truth, featuring Al Gore, which is headed for theaters? It seems you’ve hit on a way of making climate science palatable to the public. Well, I consider that a compliment. It has been my goal this year to permeate popular culture with this issue, and to use all of the resources that I have available to me to make that happen. One of those resources is my relationships with comedians and my ability to produce comedy. And then, obviously, my relationship with HBO. Just using everything I can to take this issue off the science pages and put it on the front pages. My feeling is that if people don’t start demanding change, the government is not going to change. My crowning achievement was a prime time Fox special this year, The Heat is On. Fox did a really good job. We have to reach everybody; we can’t keep talking to ourselves. I’ve given up on that strategy completely after the last election. My goal has been to reach people that wouldn’t normally be seeking the information. Your documentary Too Hot Not to Handle is going to be airing on Earth Day, April 22, on HBO. Are you trying to organize viewing parties? There are actually going to be viewing parties all over the country. We are giving copies of the documentary to all the mayors who have signed onto the climate change protocol, an ad hoc, grassroots version of the Kyoto Accords. So, every mayor who signed onto that is going to get a copy of the documentary to premiere in their city or town, and hopefully there’s going to be lots of watching parties all over the country. You said your goal is to penetrate popular culture and that’s a really tall order. Do you think that if people were to sit down and watch Too Hot Not to Handle, or if they maybe notice on Curb Your Enthusiasm that Larry David drives a Prius, do you think these things are gradually adding up? Are they convincing people that global warming is real and other environmental problems should be taken seriously? I think that’s happening, along with what people are experiencing day to day in terms of extreme weather events. In Washington, D.C., the first week of March it was 85 degrees. You know there is something wrong. There were 113 tornados in Kansas at the beginning of tornado season. We are two or three months away from the next hurricane season. So I am hoping that people will start connecting the dots between what is happening out there and this issue, and the only way to get them to do that is to try and educate them a little bit. #8212;because they were the wrong ones. Cars are being made today that are going to be on the road for the next five to 10 years, and they’re polluters. Power plants are being built that we are going to be getting energy from for the next couple of decades. They’re dirty and they don’t have to be emitting as much carbon dioxide as they do. So there is an urgency here to really get people aware of this issue and make this a priority of the American people. The rest of the world is engaged on global warming. How much do you think Hurricane Katrina was a wake-up call for people? I think it was a giant wake-up call for people, and I’m a little fearful about what is going to happen with the next hurricane season. Warmer oceans are steroids for storms; that’s global warming. I can’t even imagine what is going to happen next. I mean, 2005 was the hottest year on record. We are increasing our carbon emissions; we’re certainly not decreasing them. So what is 2006 going to be like? My impression is that people have reached the point where they understand that global warming is real, but they are still in the phase where they think that it’s not really going to affect them. They see it as slow acting, down the road, maybe affecting their children’s children. That is complete and total misinformation. Scientists are the most cautious humans on the planet, and they are now all saying that they have underestimated everything. They are saying we now have less than 10 years to start slowing this down. Less than 10 years. If you need a better wakeup call then that, I don’t know what it is. And if they are saying less than 10 years, my feeling is that it’s probably five years. If you read books like The Long Emergency by James Howard Kunstler, basically he thinks global warming will interact with the end of cheap oil to present an unprecedented human crisis. I personally believe the crisis is here now. And there are so many examples of it. One is in Ohio. I spoke to two maple farmers. Their families, since right after the Civil War, have been making maple syrup. Well, the trees are so confused there that the buds came too early, and there won’t be any syrup coming out of Ohio this year. That’s right now. What’s happening to the ski industry, where kids come home from winter break and lose their jobs at ski resorts because there is no snow? That’s right now, too. Look at what’s going on in Arizona, with the drought and the dust storms. That’s going to affect everything. Too Hot Not to Handle points to the impact being felt right now in the U.S., and that’s why I think it’s such a powerful show and why it’s so important that everybody watch it. The truth is there is not another issue that is going to directly impact people’s lives in the same way as global warming. Not Iraq, not terrorism. Are you finding the TV networks more receptive to this message than they were, say, a few years ago? It seems things are shifting a little bit. There is so much evidence, and such a consensus on this issue that it’s overwhelming. Every month that goes by with this crazy, extreme weather convinces more people. I think you are definitely seeing more attention in the media—60 Minutes, Fox, ABC, CNN are all covering it. It’s a good thing and not a second too soon. Research assistance by Erin Coughlin.